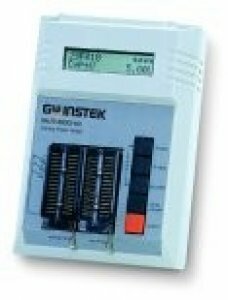 The GUT-6001C is a small, lightweight, battery or DC operated Flash writer. Two rows of 32pin connectors accept various types of ROM/EEPROM/FLASH EPROM ICs. Powerful features include test library, full screen editing, fuse map, HEX/ASCII memory, and flow chart/voltage/pulse width programming. The PC based mode, using a USB connection and a Windows XP compatible driver, gives this tiny device the depth and power of a desktop device.